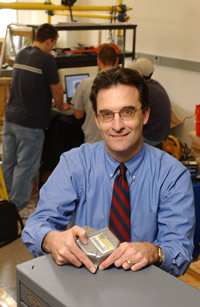 H. Clay Gabler is a Professor and Chair for Biomedical Engineering Graduate Studies in the Department of Biomedical Engineering and Mechanics. He received his Ph.D. in Mechanical and Aerospace Engineering from Princeton University. His research interests are in injury biomechanics, vehicle crash safety, crash injury epidemiology, crash modeling, crash avoidance methodologies, and protection of vulnerable road users, e.g. pedestrians and motorcyclists. He is Associate Director of the Virginia Tech-Wake Forest Center for Injury Biomechanics. Dr. Gabler is a Fellow of the Society of Automotive Engineers (2009) and the Association for the Advancement of Automotive Medicine (2012). He is a recipient of the SAE Lloyd L. Withrow Distinguished Speaker Award (2008), the SAE Ralph H. Isbrandt Award (2005), the SAE Ralph R. Teetor Award (2003), a Dwight D. Eisenhower Fellowship (2001), Princeton’s Luigi Crocco Prize (1995), and a Guggenheim Fellowship (1992).